In an era of international outsourcing, your investments in this fund--which focuses on labor practices and workers' rights--will accrue exponential returns. The worker is the core of our system, so the board takes a keen interest in quality assurance for this fund. To workshop a project in The Labor Fund Forum, click on its VIEW button. "Attach fake tags to garments explaining the various ways that sweatshop labor saves the consumer money." "The Bush administration claims it is liberating the Iraqi people from Saddam Hussein. Some country or other body should announce military plans to invade the US in order to liberate the American people (and the rest of the world) from the Bush coup. Justifications could include not only corrupt seizure of power, but also human rights violations, domestic policy that forces increasing numbers of people to live in impoverished and dangerous conditions, etc." "This is a low-tech, inexpensive agitprop tool that can be used for living wage campaigns. Alter the yellow plastic safety floor signs that are used when janitors mop floors...instead of the pictogram of the 'falling man' use pictogram of figure pulling it's pockets out, denotating poverty, and the words CAUTION - CUIDADO, WAGE SLAVERY! DON'T STAND FOR IT. Would be a great visual during a student or worker occupation of an administration building, especially an oversized one." "Find out which politicians voted for allowing drug testing in the work place, and lobby for them to have their urine tested too. Write letter as their constituents demanding they have their urine screened regularly." "Make a website that allows people to easily find out which clothing brands are produced, or conversely not produced, using sweatshop labor." "Program a computer game designed to prepare the user to work in a fast-food restaurant. Distribute it free of charge to American public schools. The crowning achievement would be to have the game endorsed and distributed by one of the major fast-food chains. Publicize." "Stage a new trend in which the upward rise of housing costs in major cities leads corporations to lease office cubicles to workers who then live in them. Set up residences in an office building with personal belongings, cots, etc. Get the story on national news, use it as a way to talk about increasing dependence on large corporations." "Place 'Sally Struthers'-style leaflets, detailing the poor working conditions that exist for those who assemble athletic footwear, in major-brand athletic shoes, their shoeboxes, or the shoppings bags containing them, before or as they are being sold. Workers in many cities are being sought to plant the leaflets on an agreed-upon day, especially in 'flagship' stores. Media must report on it." 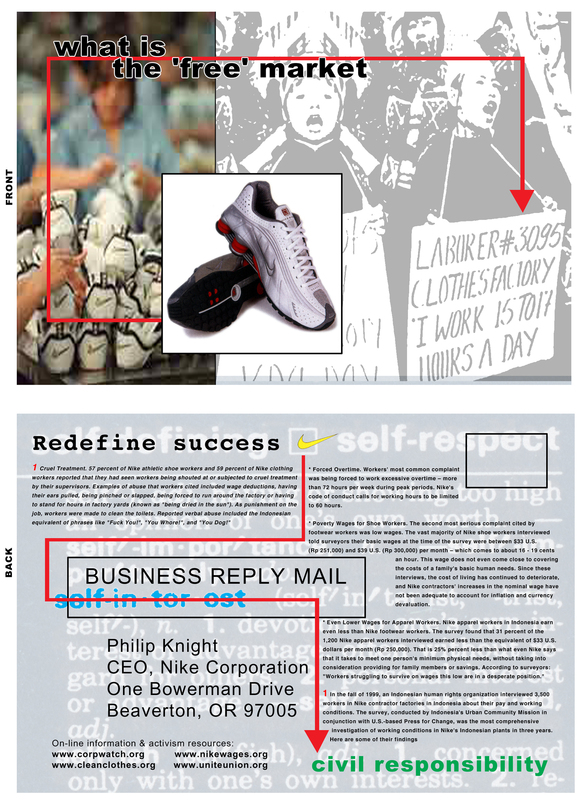 Click here for a sample leaflet sent in by a NIKE subscriber (and here for high-res version of same). "Make a database of all the worker-owned companies in the United States. A web page that has been started for this is here. Please submit any information about worker-owned companies." "Place this brochure advertising 'Deportation Class' seating in airline seat pockets and airport waiting rooms to help show how commercial airlines are complicit in government deportation programs that treat people as inferior to trade goods. Download and print before you fly!" See also project AIRP. "The Department of Space and Land Reclamation is a campaign to reclaim all space, land and visuals of Chicago. Throughout the city, citizens will tactically intervene in streets, allies, parks, corporate atria, and other crevices of the Chicago urban landscape. Additionally, at a secret hub participants will lounge, eat food, attend discussions and plot the more sustained redistribution of all space and land." 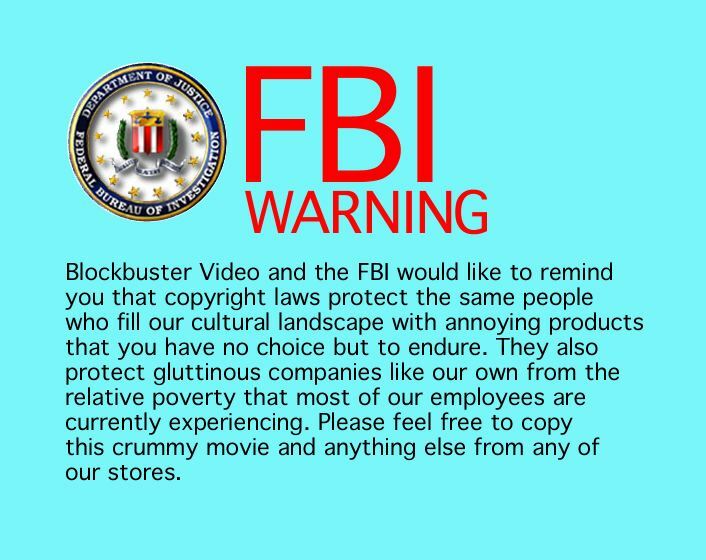 "Insert realistic collector cards into cereal boxes, each with a photo and description of one of the many workers that has been killed or maimed at the cereal manufacturer's factory." "Get rich white guys in sports bars to pick oranges and pay for it by inventing a video game that activates telepresent robotic labor. Disguise the fact that game players are engaging in labor by camouflaging the game as a first person shoot-em-up. Donate video game profits to the UFW. This project could be accomplished by staging it for the media, but in that case the investment capital goes directly to the UFW." "Print stickers resembling 'Inspected by' stickers but including as well pictures of either individual sweatshop workers, or the insides of sweatshops. Go into stores (Gap, Banana Republic, etc.) and paste away." "Manufacture cards to be placed with sweatshop-produced apparel (in shoe boxes, shirt/pant pockets, etc.) in department stores. Cards can contain such phrases as 'Handmade just for you by Juan, your Honduran friend. 3.5 cents of your purchase will go towards feeding my family. Thank you!'" "Take old filthy clothes you are going to throw away, affix price tags of $100 or more, and place them on hangers on the racks of your local GAP, Abercrombie and Fitch, etc." "A urinalysis lab worker should save and return as 'corporate property' all tested urine of new hires in a mass mailing to the CEO of a major corporation. The return of urine to its 'rightful owners' should be made into a highly visible press event." "Start an athletic apparel company called 'Sweatshop' which will sell t-shirts and other sportswear made ethically (but not marketed as such). Use media and word of mouth to popularize the brand as a constant reminder that most apparel is still made in conditions that are little better than slavery."